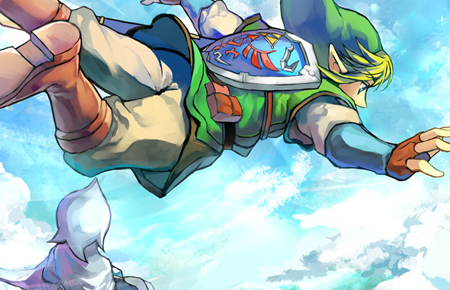 Night Cap: What Do We Really Know About Skyward Sword? It seems like it’s been forever since we actually had a nice talk about Skyward Sword. Of course, part of that is because we missed our schedule for Skyward Sword Enemy of the Week (which we are going to do tomorrow), and the rest is simply because we’ve had so much else to talk about the past week that Skyward Sword was sort of thrown to the side. What better way then to get back into the discussion then recapping what we actually know about Skyward Sword: Not rumors or guesstimates, just the facts. I’m calling this the Night Cap, because frankly a Daily Reflection isn’t such a good name if we’re not actually reflecting on anything, let alone doing it daily. Keep in mind most of the information is a recap of what we know, and thus is regurgitated. You’re not going to find anything new here that wasn’t already known, rather it’s just a gather of what we have learned since E3 last year. The more we hear about Project Cafe, the more we think about what happened to Twilight Princess and the release date Nintendo stated came and went as it got delayed for the Wii. We naturally can’t help but worry it could happen again, but one would think Nintendo learned from that last experience. Grant it, Project Cafe is supposedly backwards compatible so in reality, it would be the same control scheme with improved graphics, but in the end they are still pushing the Wii this year, and thus it’s pretty likely it will come out before this holiday season. Miyamoto and Aonuma have both confirmed this, and the recent log was it is in the final stages. Everything right now is pointing to a release this year, and we haven’t heard anything different. It may sound like we’re starting off with something that isn’t factual yet, but lets just say I have a lot of faith in Nintendo right now to not let me down. Besides, we gotta get the questionable facts out the way so we can move on and forget about what we’re all afraid of happening. This is a given, but you’d be surprised what gamers are holding out hope for, especially since at one point Aonuma scratched the motion control idea. For better or worse, Miyamoto simply wouldn’t let that happen and made a strong push with Motion Plus. Either way, the fact remains that Skyward Sword is going all out with Motion controls. It’s going to either make this game one of the best ever, or going to cause it to fall on it’s face. A lot is riding on this game fulfilling the dreams of millions back in 2006 when the Wii debuted. It doesn’t help that very few games have truly shown off what real motion controls can do at this point. Skyward Sword has a lot riding on it for the sake of motion controls being in serious games down the line. Link can now sprint, use sword beams, and block with his shield all over again. Of course, the blocking is more dynamic this time around, the sword beam is more fleshed out, and the sprint feature can lead into climbing higher up walls. Everything has been improved, and it feels odd that all of these old mechanics took so long to make a real return. The main sword at some point becomes the Master Sword, making this game part of an origin story for the most fabled weapon in all of gaming. The fact it also has a spirit (which is presumably your helper in the game) only adds some intrigue to the entire situation. We have the gist of what the spirit looks like, but we have yet to see the final form. Imagine something like that, but better. Now imagine it’s throughout the entire game. I truly hope that Nintendo takes this to the next level and introduces some truly unique pieces of music specifically designed to take advantage of a full orchestra. As has been seen in the demo, Link now has a stamina meter that appears whenever you doing something that requires great effort, such as sprinting and/or vine climbing. This means you can’t do either indefinitely, which will make some of the climbing sections of the game a tad more challenging. To me, this is mostly a straight difficulty enhancer and really nothing more. They could of easily just put a time limit on the dash with a cool down and call it good, but the fact it effects other aspects of the game leads one to believe they are committed to making the game a richer experience. They also happened to introduce the Quick Select System, allowing you to change items and drink potions on the fly without needing to pause combat. New items like the beetle and a first for the consoles, a whip, are easily changed back and forth as needed. This naturally keeps the flow of action and combat much more fluid, and should result in a more interesting combat situation. It could also mean new enemies that require multiple items to beat on the fly. Imagine the possibilities! Just to keep things short and sweet, there are a lot of other minor things that aren’t worth going into great detail about. The Skyward Sword will somehow be able to help you find treasure as an example. There will be times when you will be forced to navigate areas without your sword. Zelda will make an appearance eventually. Skyward Sword takes place before Ocarina of Time. Link lives in Skyloft and travels between there and “Hyrule” throughout the game. There may be some minor facts I have overlooked, and some much rumored stuff that I have completely ignored, but in the end Skyward Sword is certainly heading in a direction I like. Stylized graphics, returning use of old features, and an increased difficulty level all have me extremely excited. It also helps that there is an origin story in their for the most fabled weapon in all of Zelda. E3 cannot come soon enough.